KAAY is a 50,000 watt, class A clear channel AM radio station in Little Rock, Arkansas, licensed on 1090. KAAY was turned into a Top 40 station in 1962. It has been stalwart of Christian radio since 1985. KAYY's cult status was forged in the late 196's when, after 11:00 each evening, the station abandoned the standard Top 40 format for three hours of underground music with the program Beaker Street hosted by Clyde Clifford. During the station's heyday, KAAY featured a full-service Top-40 format. During the 1960's and 1970's, on-air personalities included Mike McCormick, Doc Holiday, Jonnie King, Buddy Karr, Ken Knight, Sonny Martin, newsman George J. Jennings, Wayne Moss, Phil North, and Ray Lincoln of the "Ray and Ram Program." Its nighttime signal extended well beyond Little Rock and Arkansas, covering much of the Great Plains. KAAY could be heard clearly at night in Key West, Florida, and as far tot he northwest as Jamestown, North Dakota. It could also be heard late at night clearly as far south as Cozumel, Mexico. In the late 1960's the jingle started out with roaring thunder followed by a deep voice...FIFTY THOUSAND WATTS OF MUSIC POWER K >> DOUBLE-A Y Little Rock. On Labor Day weekend of 2003, the station returned to its roots with a historical segment called "KAAY Rewound". 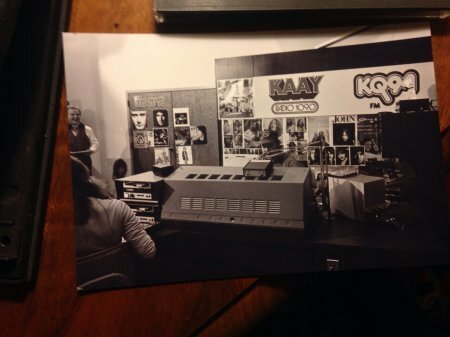 KAAY'S Barry Mac and sister station KARN's Grant Merrill played the hits and took calls from all over the country. Clyde Clifford returned to talk about "Beaker Street". This eventually led to a weekly segment called "Radio Yesterday" which features the memories of the station's heyday.